Adamsdown Song on top of the world! Sunday 24 May was a fantastic day in South Wales. The sun shone, the half term hols had just begun – and Adamsdown Song had made it to number 1 in the internet’s biggest pop chart! No-one should underestimate what an achievement this is. Soundclick is the world’s top site for musicians uploading their own material. Hundreds of new songs are submitted every week, many of them by artists with serious aims of making it in the music business, who spend an awful lot of time and money promoting their work. Pupils from years 5 and 6 from three Adamsdown schools have beaten them all. Congratulations to everyone involved. Now we can look forward to the launch of the CD on June 11, when everyone can finally get their hands on it! Top 25: can we make the top 20? Adamsdown Song is still climbing the internet charts, even if it is only one place to 25! There’s still a chance we can make the top 20 if everyone redoubles their efforts to get friends, family etc not only to play the song but also download it – the link’s still on the right. Please note – this website won’t be updated till Monday, but you can keep a check on the chart position on Soundclick. Adamsdown Song now at 26! The rise of Adamsdown Song up the internet pop chart (see below) is unstoppable! Today we’re at number 26. We’re also featuring in the South Wales Echo, so a warm welcome to Echo readers – check out yesterday’s article for how you can help Adamsdown pupils rise even higher in the world’s biggest non-professional music charts. CDs of the song are at this moment winging their way to Cardiff. They’ll be on sale at a number of outlets in the heart of Adamsdown, Clifton Street. If you want to be kept informed of when and where you can get one of these unique records, send us an email. You can also keep in touch with latest developments by joining the facebook group (see link on the right). Everyone involved in the project will get a free CD, and as our grant only stretches to a few hundred copies, supply is limited – but if there’s enough interest we’ll get some more made. They’ll be sold at cost price of £1. Unless any friendly record company wants to take over manufacture and distribution for us, that is! Don’t forget to click on the CD cover to the right and play the song, and keep spreading the word! We’ve made the top 40! Adamsdown Song is still rising up the Soundclick pop chart, the biggest independent music chart on the web. We’re now at 39! There’s now a facebook group for fans of the song – check the logo on the right. To post a link to the song on bulletin boards and networking sites, copy and paste http://soundclick.com/share?songid=7584410 . Adamsdown Song’s world chart success! Soundclick is the world’s largest site for people uploading their own music. Over 100,000 songs compete to be in Soundclick’s pop chart – the biggest category on the site. This morning Adamsdown Song has broken into the top 50 of that chart – it’s at 46. This is a huge achievement for the pupils of the three Adamsdown primary schools who sang the song and helped to create it. Congratulations! Just to emphasise, Adamsdown pupils are not at 46 in the UK, but 46 in the whole world. Now we can look forward to the CD, which should be ready this week, and the launch on June 11. All kinds of people are showing an interest in the launch, and we’re hoping to have some relatives of Adamsdown’s 1927 FA Cup hero Fred Keenor at the event! Keep clicking on the CD cover on the right to play the song and keep it in the chart. Details of Adamsdown Song on the radio can be found in the article below. Launch put back to 11 June – but word’s getting round! Due to some problems arising with the original launch date, Adamsdown Song will now be officially launched on June 11th, 4pm, Adamsdown Primary – a long time to wait, but most importantly everyone involved with the project can be there. Don’t forget to click on the CD cover on the right to get Adamsdown Song up one of the most important internet charts. The song was on BBC Radio Wales yesterday – the show can be found here. Interview starts about 1hr32 and song at 1hr40. More feedback on its way. 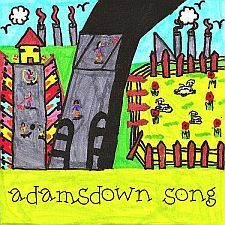 The long-awaited official launch of Adamsdown Song will be on Tuesday June 2nd, 4pm, at Adamsdown Primary School. Adamsdown Primary was chosen as the most central school in Adamsdown, and hopefully pupils and parents from Stacey and Tredegarville Primaries will have plenty of time to get there. The exhibition of pupils’ work from the project will be on display, before moving on to Roath Library where it can be seen for the following week. Invites will be going out to the local media and everyone involved in the project – but anyone interested in Adamsdown Song can attend. See below for other recent articles about the song and don’t forget to play it on Soundclick next Monday (18 May) to get it up the Soundclick chart!